I’ve spent more than two decades steelhead fishing the tributaries of Lake Erie for steelhead and I can honestly say this has been the most unique year ever. Some days we drive up and fish and put up decent numbers. Other days we struggle to catch one or two fish. 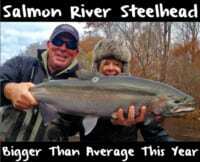 We’ve had to work hard this winter to catch steelhead. While I’m not biologist, I’m using common sense to try and figure out what’s going on. It’s been crazy. Honestly, I think the smaller number of fish in our systems is in relation to a lack of rain in the fall. I personally think the lower than average precipitation and higher than normal water temperature forced the steelhead to remain in Lake Erie rather than migrate into the tributaries when the water was below ideal temperatures for steelhead. Considering this, I think the steelhead stayed in Lake Erie and didn’t return in large numbers. This late winter and spring two things could happen. On this side of Lake Erie we don’t normally see a large spring steelhead run. However, we could see many of these fall fish return late as flow increase in a few weeks. Or, it could end up bring a poor return year. It’s clear this winter’s run is yielding smaller steelhead. Normally, the fish are five-to-seven pounds, on average. This year, a four-or-five-pound fish is more common. On an average year I catch a dozen fish over 10 pounds. This year I’ve caught probably three. Now and the next few weeks we’ll start to see some of the steelhead that are upstream start to head back into the lake. We could see a lot of fish move back into the lower end of the systems as drop backs. There’s also a possibility of fresh fish coming in as water temperatures warm and flows increase with the spring rains. For the time being, I just got back from fishing Erie and it’s clear there aren’t as many fish on the lower end of all of our creeks. These fish are in the mid to upper reaches. Anglers that are willing to park, walk and cover ground, instead of just hitting roadside access, are doing best. The public access areas are receiving a lot of pressure. You’ll increase your chances by walking away from them and avoiding crowds. If you want to catch winter steelhead in Pennsylvania drifting cured eggs and using live minnows is standard. I’m curing my skein in either Pink or Orange BorX O Fire and fishing them in chunks. When using single steelhead eggs I cure them in either Natural BorX O Fire or Natural Fire Cure and tie these in dime size sacks. If the water is dirtier the skein is most effective, whereas the sacks are best in low and clear water. Rigging up properly is important, too. I use six-pound P-Line monofilament as my main line and four-pound Berkley Vanish as my leader line. When using skein or sacks I use a Daiichi 1150 size 14 hook and drift the eggs under a Raven or Sheffield 2-4 gram float. Editor’s Note: James Swearingen is the founder of Steel City Anglers. 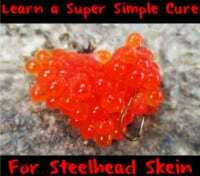 For more information on please visit https://www.facebook.com/steelcityangler/?fref=ts.